Luggage racks should be versatile, robust and fit for burdens. The best known are the rear racks (rear wheel racks). They often carry 25kg – 30kg. Many are prepared to be mounted on the so-called Pletscher plate, which is often found on trekking bikes (it usually also serves as mounting for mudguards). The Pletscher plate is less commonly found on mountain bikes. In contrast of the luggage rack on the rear wheel, there is also the possibility to install a rack at the front of the bike. Front wheel luggage racks are mounted on the front wheel. Or the so-called lowrider racks which are mounted on the front wheel fork. They are nowadays a well-known variant and are often used in combination with panniers / side bags. Current lowriders affect the steering behaviour only a little, while in contrast simple front wheel luggage racks change the steering movement and thus affect the riding comfort. A definite plus for lowrider racks! It's possible to additionally install a rack even for full suspension bikes (with rear shocks). These racks are fitted thanks to a cable clamp on the seat post and can carry 10kg most of the time. Whether on the front or the rear of the bike, they are in principle mounted quickly and easily. Besides the seat post racks, there is also the possibility to mount to the rear stay or when even rack to be mounted on the disc brake support (offered for example by Tubus Disco); the installation here is somewhat more difficult. There is also variety in the type of mounting, in width (trim or wide), in carrying capacity (load), and the material choice (often aluminium or steel). From Tubus there is even luggage rack made of titanium (despite the light weight, titanium is extremely solid, weatherproof, and thus indestructible). Above all, you should still pay attention to your wheel size. Of course there arebicycle racks for different wheel sizes (26, 28 or 29 inches) available. Installation with small bike frames is most of the time more problematic. Accordingly there are special luggage racks for children's bikes. In our online shop, you can find among others top brands like Tubus and Racktime, which we recommend for demanding bike trips. There are also combinations which offer everything in one including mudguards (combination from Specialized). Racktime offers for example also luggage racks including rear lights. Looking for a spring clamp for retrofitting? You can find it too here under Accessories & Spare parts. 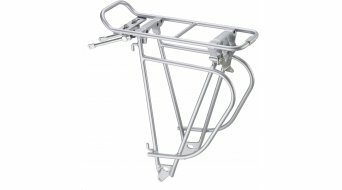 Whether it's for a long trip on bike, as a small packhorse for your city-trekking bike or a trim luggage rack for road bike, you have a wide range of choices with good prices here in our shop for luggage racks! One tip needs to be given: Please observe the permitted load capacity for the package weight. For the shorter transport routes, bike baskets are also suitable. The baskets are available as handlebar basket or as rear wheel basket. The rear wheel basket is mounted on the luggage rack and offers more storage space than a basket on the handlebar. Perfect for small things, but not suitable for big loads. With a bike basket, you can for example take your purchases safely back home or bring what is needed for a picnic on the grass of the park nearby. Most of the time the baskets are to be mounted with a simple clip system (called for example KlickFix by Brooks). There are a few variants. Are you looking for a luggage rack basket with or without handles, with little or lots of storage volume, an open or closed basket, a basket of plastic or metal wires? You can find the right offer from us in the category Bike Baskets!